On Jagged’s 13,824 foot summit. 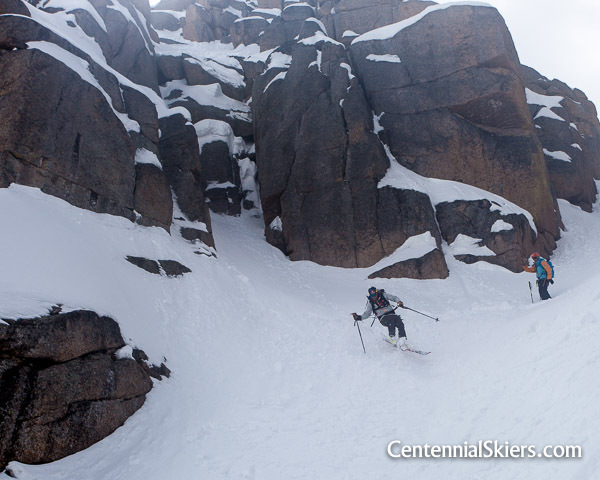 We climbed and skied Jagged Mountain, our 100th and final ski descent of the Centennial Ski Project. Christy, Chris, and I, along with our friend Pete Gaston, emerged from a four day trip in the Weminuche Wilderness on Thursday, in awe of a mountain that presented more challenges than any other we’ve encountered through this project to date. It was a fitting final summit, a microcosm to the whole incredible larger objective. 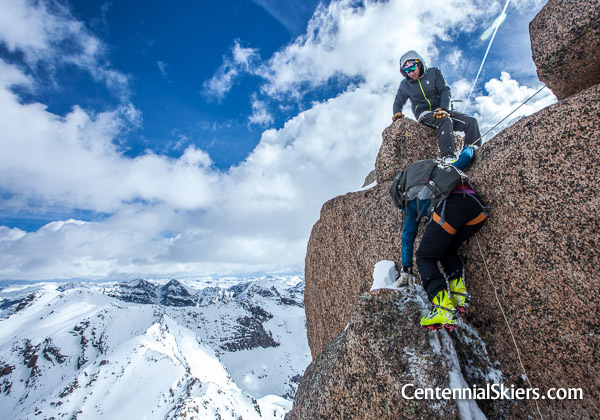 Our goal to climb and ski the 100 tallest mountains in Colorado was almost monumental in scale, and our experience through it all can not be summed up in a single blog post. It would be a disservice to even try. The three of us invested so much time, effort, energy, and focus, it will likely be a while before we’ve processed it all. That said, we are incredibly grateful for the whole experience— the time out in the mountains doing what we love, with the partners and friends who joined us along the way. 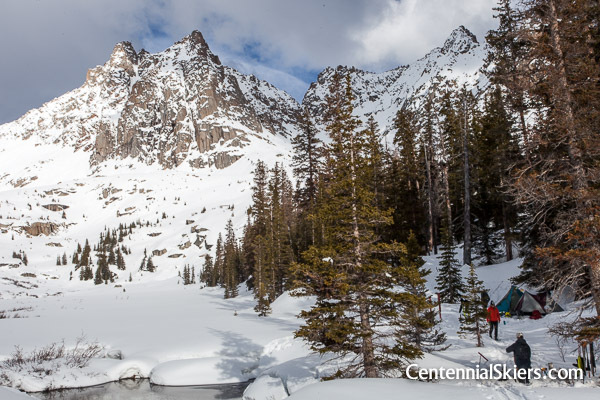 We feel fortunate to live in a place like Colorado, where something like this is even possible. Our first camp at the base of Noname Creek. 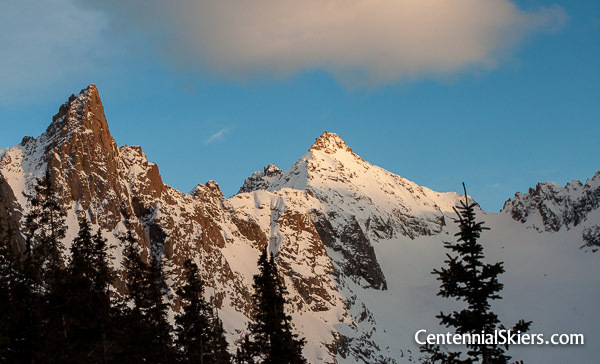 Jagged Mountain, 13,824 feet, is considered to be the most remote, rugged, and challenging summit of the Centennials. A nine mile approach on a steep, unmaintained trail along Noname Creek is required, and it takes more than a day to complete. 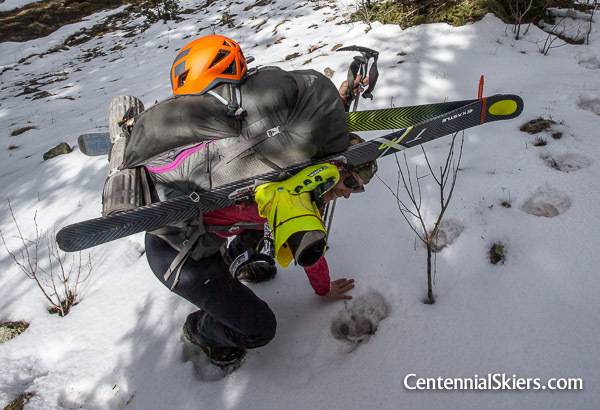 Add isothermic snow, mud, and a seemingly impossible number of downed trees to navigate with massive backpacks to the challenge of just getting to camp. Some fresh and rather large bear tracks in the snow, the only evidence of any other recent travel by anyone or anything in this area. Six hours into the second day’s approach we crested treeline and caught some expansive views. Sunlight Peak, Knife Point, Grey Needle, and the west side of Jagged stand right to left. Our high camp below Jagged Pass, where spring weather moved through all afternoon. When it cleared it was a sweet spot, and put us in a great position for the next day’s climb. 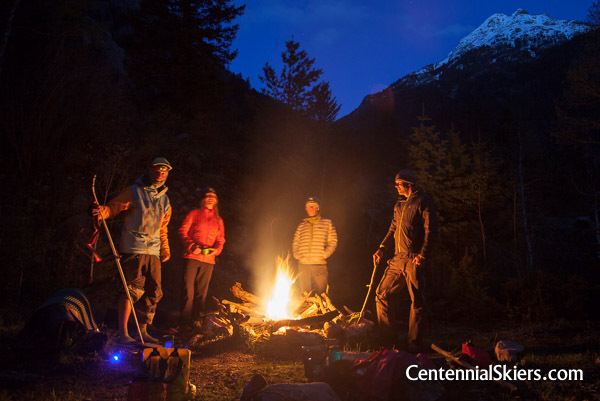 Once at high camp you need to get prepared for the most sustained and airy climbing of any high summit in the state, which can be daunting even in dry, summer conditions. 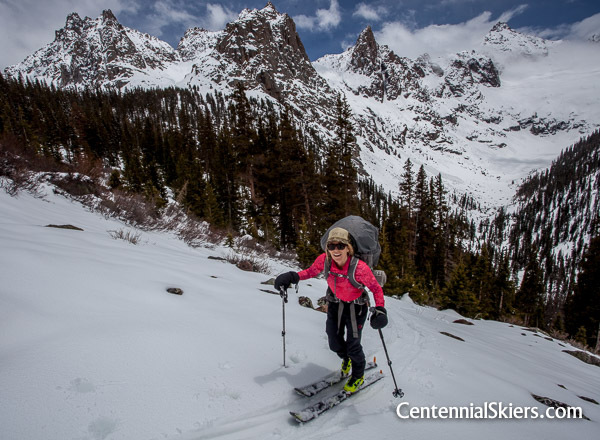 Add skis to the mix, and snow on the steep rock faces, and it suddenly feels as though it’s in a category of difficulty unmatched in Colorado. 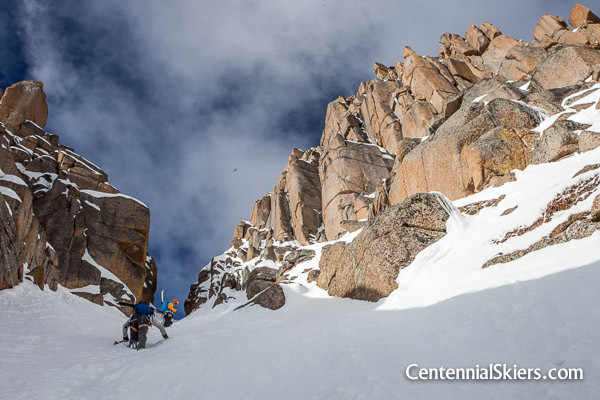 The terrain steepens as you move higher, and several cruxes of 5th class climbing are required to get to the top. And of course if you make it to the 13,824 foot summit, you’re only halfway done. You have a lot of work to do to get back home. An aerial recon photo of the north face of Jagged from last year. We planned to boot up the couloir marked with the dotted line, and then climb the mixed snow and rock to the notch right of the summit. The finish of the route was on the other side of the mountain. 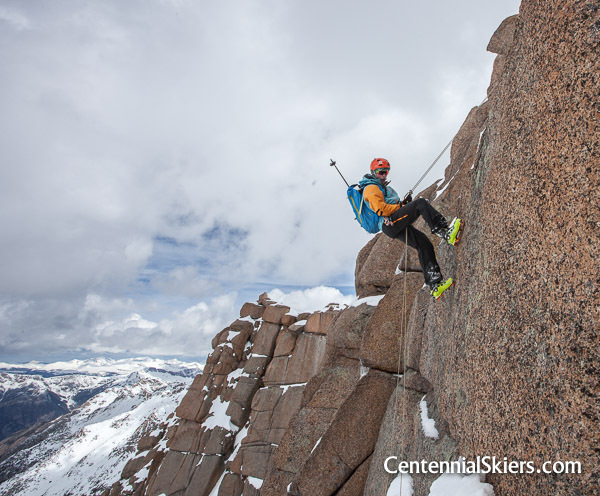 Jagged is one of four Centennials that are not skiable from their exact summits. The others are Wetterhorn Peak, Dallas Peak, and Teakettle Mountain. 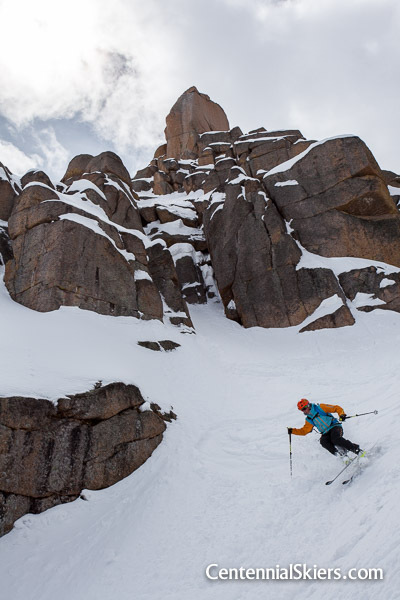 In these instances the topography simply doesn’t allow for skiable lines to fill in, and the accepted practice is to climb to the summit and then descend and ski from the highest point possible. 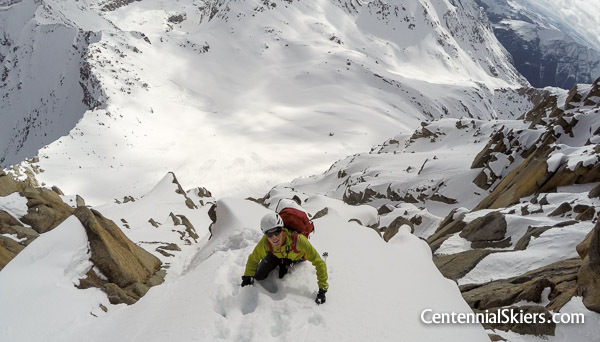 We had been unable to find any info on climbing Jagged with snow, much less with skis. 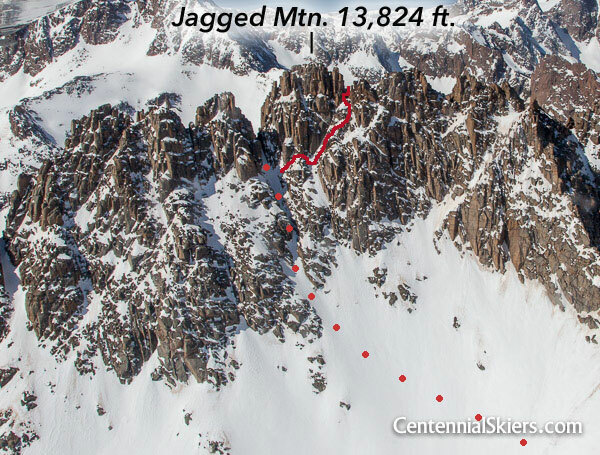 Our recon, which included an aerial flight around the mountain last April, showed the most practical ski route to be the Jagged Couloir, a tight, north-facing chute to the lookers left of the summit. Due to the lack of proven ski history here and our recon photos, we had determined this couloir to be the highest skiable snow line on the mountain. Photos of the south side didn’t offer any better (higher) skiing options. 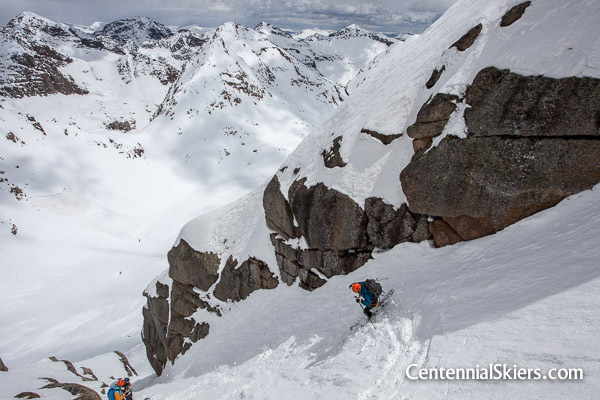 We needed to climb the couloir, stash our skis, complete the route to the summit, rappel/downclimb to our skis, and ski the Jagged Couloir off the mountain. 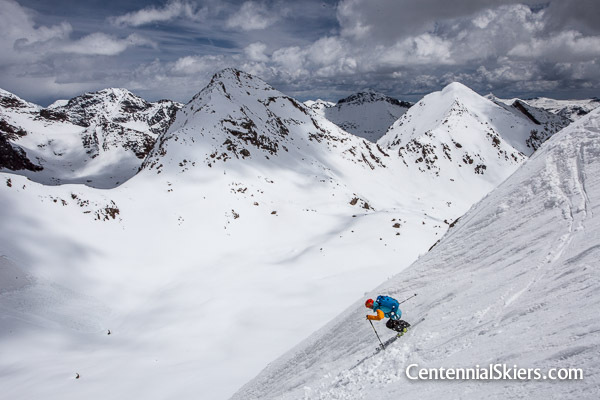 It’s our opinion that this is the most aesthetic style to ski Jagged, according to current standards of ski mountaineering. 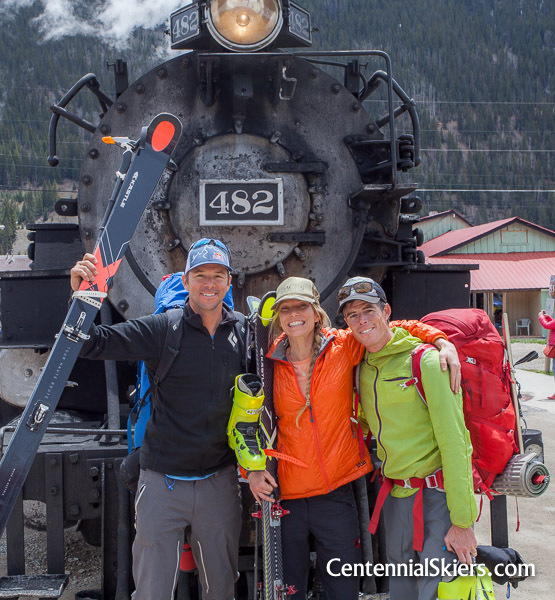 As prepared as we could be, we hopped on the train and headed into the Weminuche again. We got off at Needleton in pouring rain, and made our way to a comfortable campsite at the base of Noname Creek where we stayed for the night. The following morning we were up early to continue the approach to our high camp below Jagged Pass. Rugged terrain made for a slow pace and we found ourselves in more passing spring weather (rain and graupel), but we made it to our planned camp near treeline by early afternoon. 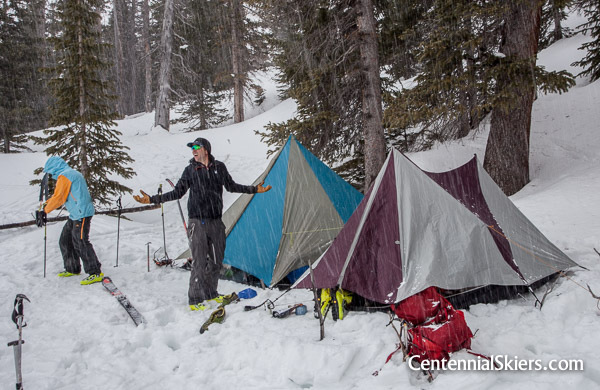 There was a lot of new snow up high from all the recent wet weather, so we dug out a camp and got settled. We were in good position for our attempt on Jagged the following morning, and we had all afternoon to dry things out, hydrate, and prepare. The alarm clock went off at 4:45am. We weren’t very far from the mountain but we still had to climb up and over Jagged Pass. Since the sun is strong this time of May, we needed the early start to stay ahead of warming temperatures and its effect on the snow. First light, on the move. At the 13,010 foot pass. Jagged’s Norh Face is in full view. The summit is actually just to the right of the prominent couloir, our ski objective. 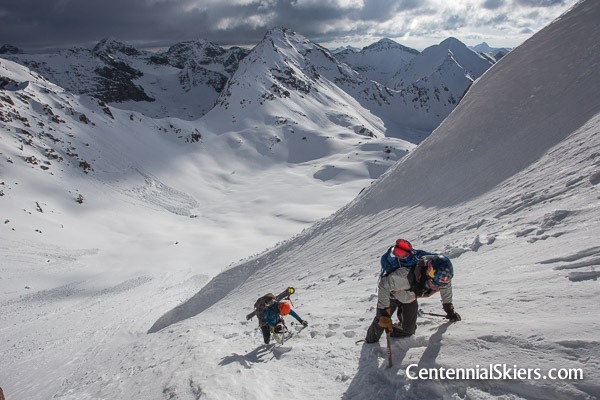 The four of us skinned up to Jagged Pass,13,010 ft. where the North Face of Jagged Mountain came into view. The weather was good, it was early, and we had a plan— it was time to get this done. 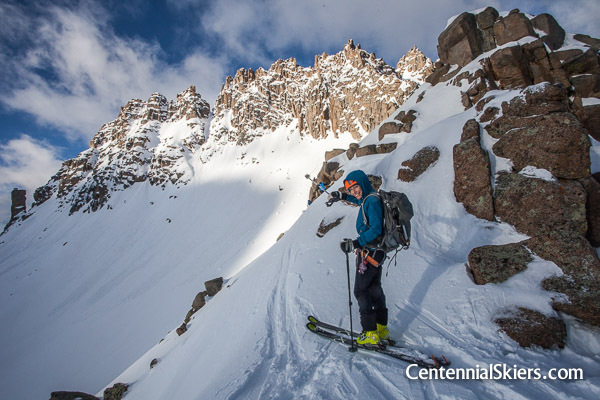 We traversed over to the couloir and headed up. The couloir tops out ahead, where we left our skis and then began up the snow and rocks to the right. The top of the ski line. At the top of the couloir we stashed our skis and proceeded up the technical sections, which were covered with more snow than we had expected. Passing clouds kept things cool but it wouldn’t be long before that snow heated up and became sloppy, and prone to wet slabs. We made good time through the cruxes of the north side, all the way up to the notch that led to the big south side traverse. 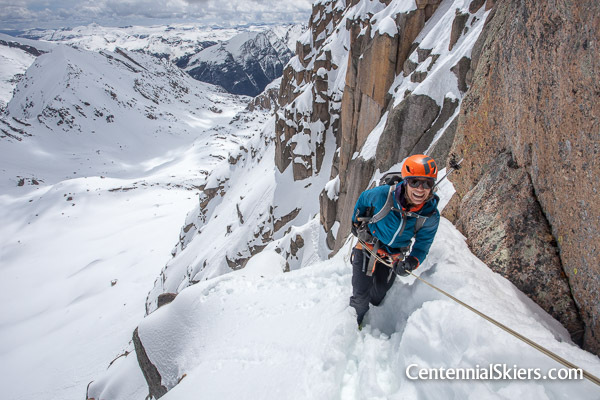 The airy traverse was followed by a steep chimney, which in turn led to the flat summit block. 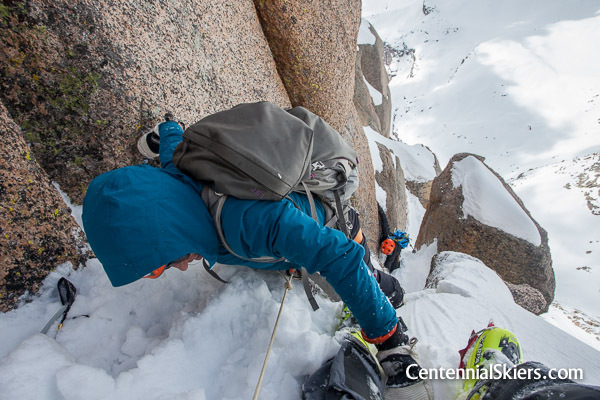 It ended up being fun, airy, alpine climbing conditions. Above the couloir and just below the notch that leads to the south side of the mountain. 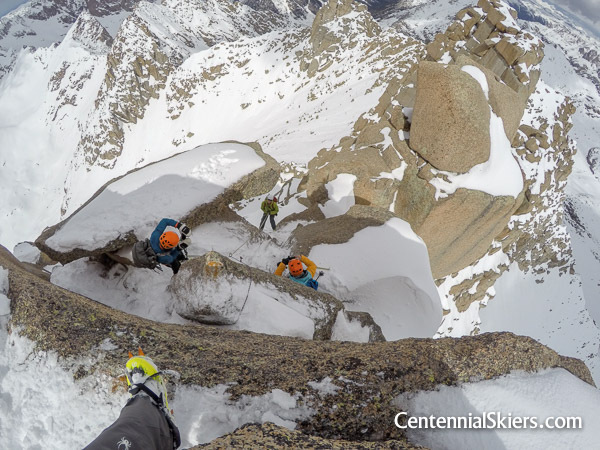 The airy south side traverse. This was snowier than we anticipated, but I don’t think I would call it skiable. Christy and Pete in the chimney pitch. Christy does a little dry front-pointing on the final step up to the summit. Before we knew it we were on top of Jagged, our final summit and the most uncertain of them all. We took in the stunning 360 views of the Weminuche Peaks that surround Jagged, and felt immensely grateful to be there. 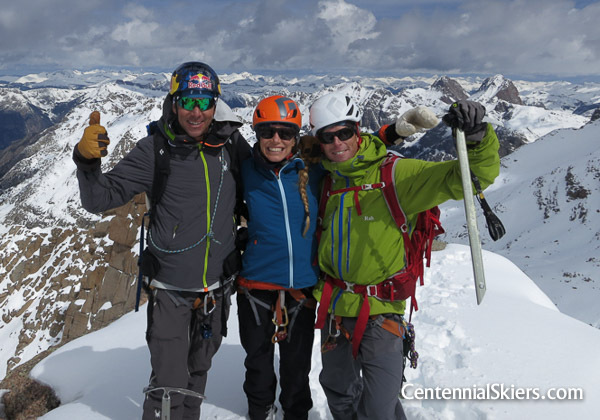 We were psyched to have made it to the summit but we weren’t celebrating yet, we still had a lot work ahead of us. Downclimbing and rappeling from the summit. 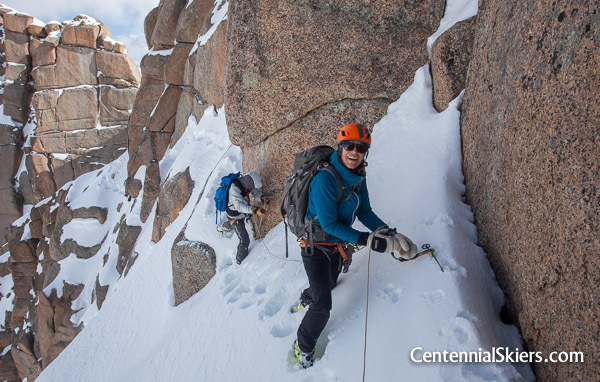 Pete raps to the south side traverse. 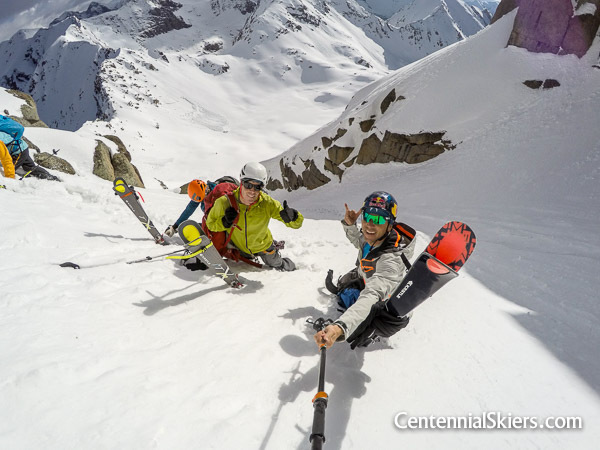 Always smiling, just a little bit further and we’ll be in our skis. 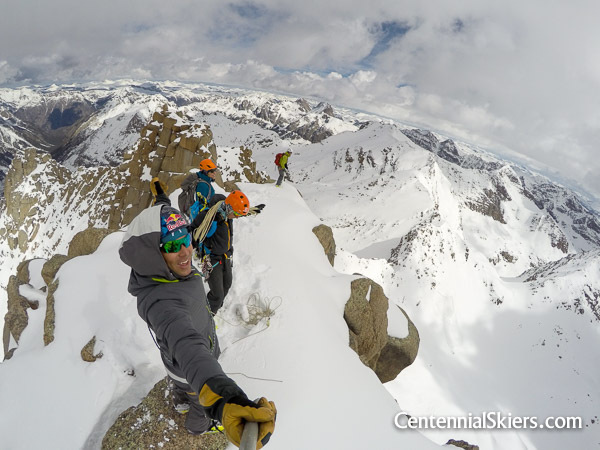 Two rappels and some downclimbing brought us back to our skis. 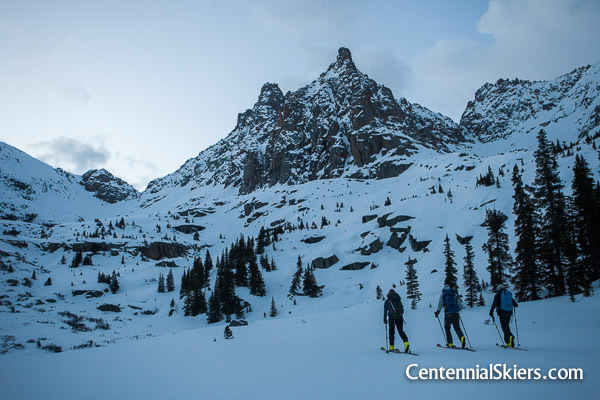 We poked our way down the runneled Jagged Couloir to a point where we could traverse back to Jagged Pass, and back down to camp. We were done. 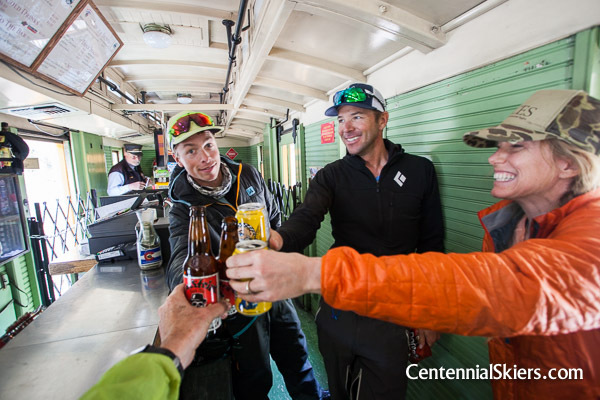 It didn’t matter that a miserable descent down to the Animas River still awaited us, we had just come to realize a goal that at times seemed unattainable. We made it down to our low camp by dark and it began sink in. We did it. And we skied. Dav here. We took as far as we could before traversing back to Jagged Pass. And the next morning we caught the 11:15 train and got right to the important part, beer. And with that, we’re done.